Browdini Review – Do you need a special tool to get perfect brows? A lot of women spend a small fortune on their makeup and if a nifty tool comes along that is going to let them enhance their makeup products and save them some time as well, then it is going to peek the interest of many women. So does the Browdini deserve this type of interest? Let’s find out. This product is a very simplified tool that you can easily handle to mark off the areas of unwanted hair on your eyebrows. It allows you to develop a sort of blueprint to follow as a guideline for which brow hair to tweeze and what not to touch, so you can get the perfect shape for your brows according to the symmetric of your face. The Company claims that by using their tool you can shape your eyebrows perfectly in 3 quick and easy steps.This means you won’t end up with crooked or unbalanced brows. With the proper use of this tool you can easily mark where your brow should begin and end and where the arch of the brow should be located. One of the biggest frustrations when it comes to makeup application is getting the brows to look perfect. The marketers of this product have capitalized on this frustration by providing what they think is an easy to use solution. They have focused on two key concerns of makeup users. First is getting the perfect brow look so it enhances their looks, and secondly this is the area which demands the most time for many when applying their makeup. Using the right hype to address these two concerns is bound to draw the desired attention the promoters are seeking. If this product has appealed to you then you will be paying about $26. which includes the shipping and also gives you a second Browdini, but you will be paying the shipping costs for this which is included in the $26. 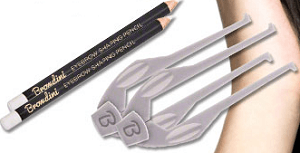 Included in this you are going to get the white marking tool that allows you to mark the desired brow areas. If you think that the Browdini is going to save you time then you better practice with it first. You are going to have to learn how to line up the tool with the brow so you are going to get the proper markings. Then you have to be precise with the white marker and create the lines so you know which hair to tweeze and what not to touch. Then you need to clean off the marker before you can go ahead with your makeup application. The concept of marking off the brows for proper shaping is one that professional makeup artists have been using for years, so it is not a new idea. You really don’t need a special tool to accomplish what this product is promoting. In fac,t using a normal pencil as your guide and following some professional tips like those at Cosmopolitan is going to give you what you are looking for. We are going to give the Browdini a thumbs down rating, simply because we don’t believe that you need to pay $26. for a tool that can be replaced with a common item like a standard pencil and give you the same results. The proper brow markings for the perfect shape of your brows is only half the work required. You need to know how to hold the guide in the proper position, then tweeze them properly, and finally be artistic with your brow pencil. There have been other Companies who have recognized the difficulties that some people run into while shaping their brows. They have come up with the idea of using brow stencils to achieve the desired results. A brow pattern is not the only tool you need to get those perfect brows. You are going to need something that is going to remove the unwanted hairs like the Finishing Touch Lumina Hair Remover. What do you think? Does the Browdini work or not? Will Invisalign Make My Teeth Straighter? Does LASIK Eye Surgery Work?